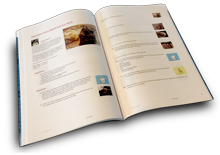 Order a professionally printed, perfect bound cookbook with a full color glossy cover and 31 recipes. De nada, my talented friend! I love this cookbook....thank you for including one of my recipes! You're welcome Sharron and Norma - thanks for posting such rockin' recipes! Have you all made a cookbook yet? It's fun! Great book Stacey and thanks for including one of my recipes in it. Have a good week end. Thank you Stacey, for including my recipe for "Warm Brownie Sundae" on pg. 23!